Chesapeake Bay Spot fishing! As the summer days give way to temperate breezes foretelling of the cooler months to come, folks of all ages anticipate the big run of the tastiest panfish on the Eastern seaboard, the Norfolk spot. The congregation of exceptionally large specimens of this popular bottom feeder hallmarks non-stop bottom fishing at its finest. These fish are easily accessible and hard fighters on light tackle, it’s no wonder the spot is a sure crowd pleaser for family-oriented excursions. The Norfolk spot is a popular sport fish best known for its reputation as outstanding table fare. They are members of the family of fish known for the drumming sounds they make with their swim bladders, which also includes drum and croaker. Although not incredibly glamorous, these miniature panfish hold their own, boasting a silvery sheen which edges to a yellowish hue in the larger fish, affectionately called yellowbellies. These little dynamos are easily recognized by a dark tell-tale spot positioned just behind their gills, lending to their namesake. Spot are not the largest fish in the ocean, but many will grow to weigh a little over a pound. While they inhabit coastal waters spanning from Maine to Florida, spot are most plentiful between the Chesapeake Bay and South Carolina, making for a very reliable fishery. Spot are available to catch all summer, but in the early fall, the larger fish gather in the lower bay, contributing rivers, shoreline estuaries, and inlets in preparation for their journey to spawn in deep offshore waters. Spot hold plenty of interest on their own accord, but I particularly recommend this type of fishing for folks searching for a straightforward target. Most often, spot fishing is my first choice for parents, especially Moms, who inquire about outings for their kids. There is no other species more rewarding for families looking for a manageable and accessible type of fish to entertain children and beginners. 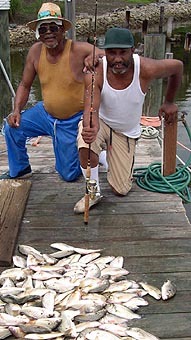 Folks without access to boats, or those who want to try some uncomplicated fishing for the first time, or who simply choose to fish solitaire, can easily enjoy spot fishing since it requires little knowledge, means of transportation, or equipment to reap the benefits of a great day on the water. Spot can be found most anywhere, which makes gaining access to fishing for them especially simple. Excellent opportunities for this type of fishing are to be had from many different resources, both water and land. Local tackle shops and piers can help determine when and where the fish are biting best, while information and reports in your local newspaper can also provide some useful tips. Many areas may also have fishing reports available online. No boat? No problem, just head for the local fishing piers, bridges, jetties, or the surf. You will surely have company, for when the big yellowbellies show, so do many locals to join in on some of the best spot fishing in the country. Many parents also prefer sticking to land activities with kids for safety and convenience reasons. Yellowbellies debut around early September, as they begin to show in the lower parts of the rivers, then move to more ocean side locations. By about mid to late September, these hefty spot become very numerous as they pack into inlets, hang on bars, and line structure near lower bay seaside areas. Mussel beds, gravel bottoms, and drop offs are always good places to look for yellowbellies. Although slack tide tends to prove least productive for spot fishing, there is no particularly best tide to try for them. But moving water, especially a few hours before and then a few hours after the change of the tide seems to yield the best luck. No fancy or complicated equipment required here. Almost any light to medium action rod, paired with a matching spinning or bait casting reel with 8 to 15-pound test line will work well for spot fishing. If your spot expedition is boat bound, a 6 to 6 and 1/2 foot rod is most appropriate. If casting from the surf or from a pier, you may want to have a rod starting at 9 feet or more for some additional casting leverage. Inexpensive combos are available at tackle shops and retail stores if you are considering an economical setup for children or beginners. The best terminal tackle for enticing these bottom dwellers is a simple bottom rig, either hand tied or purchased, adorned with number 4 gold aberdeen hooks. I have tried other styles and sizes of hooks, but the small gold hooks work the best, by far. If you buy your rig, you can purchase the gold hooks already snelled, and simply thread the leader through the areas provided. Hang a light sinker weighing anywhere from 2 to 6-ounces, and you are in business. Spot naturally feed on crustaceans, worms, and small fish near or on the ocean and bay floors. Historically, the number one bait for enticing hungry spot is the well known bloodworm. Bloodworms are squirmy, long red worms which pack a nasty pinch if given the opportunity. These bait worms are available at most tackle stores, and come packaged in bags of 10 to 12 worms for a not-so-cheap-price ranging from $7 to $10 per bag. If you are considering some serious spot fishing, I recommend taking at least two bags. 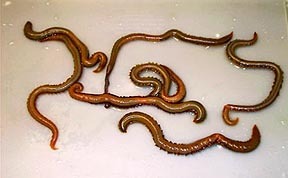 To prepare the bloodworms for bait, cut the worm into pieces about an inch long. Stand by for quite a mess; for these worms are called bloodworms for a very good reason, they are bloody. Expect to clean the remaining brownish blood stains from under kid’s fingernails, and off any surface you use as a cutting area. Thread the worm pieces onto each hook of your bottom rig for a good presentation. Bloodworms are a good spot bait, but storage during and after use can prove a little challenging. Keep them cool during use, so store them out of the sun, but not directly on ice. For longer term storage, bloodworms can live for up to a week in the refrigerator, as long as the bag is flipped daily to keep the worms from lying still. The latest big revelation in the world of fishing is the introduction of synthetic alternatives to natural bait. In the case of spot fishing, I highly recommend the product produced by Carr Specialty Baits called Fishbites, Bag O’ Worms. I first became a true believer in the magic packed in this synthetic alternative to bloodworms during an intense surf fishing tournament with my all women’s team a year ago. One of my team-mates began bailing scoring spot two at a time on bloodworm Fishbites! After her third trip up to the judge, the rest of my team abandoned our cut-bait, and pulled out our Fishbites. We landed so many spot; our judge could hardly keep up! Bloodworm style Fishbites, come in packages with 5 red strips of bait, ranging in cost from $7 to $8 per bag. This spot bait is non-perishable, so no special handling is required, and the best part is they don’t bite! To prepare the Fishbites for spot fishing, simply snip off a piece measuring about ¼ inch and push the barb of your hook through the center of the bait. The Fishbites bait material is infused onto a piece of binding mesh, which keeps the bait attached to the hook so it is not easily pulled off by the fish, so it lasts longer. Once the mesh is completely exposed, simply pull it off, and replace it with a new piece. Storage is straight forward since Fishbites don’t require any refrigeration. For long term, you can store them in your tackle box because they never expire. In fact, I have reused the same piece of Fishbites on my hook from the pervious trip, with excellent results. Considering that the bloodworm Fishbites are an effective bait, extremely easy to use, very clean, have no odor, and don’t bite…I recommend this synthetic bait for any and all spot fishing adventures involving children-hands down. In the long run, the durability and convenience of this synthetic bait makes it cost effective and an excellent choice for anglers looking for that edge. Whether I am tournament fishing or fun fishing, Fishbites is the only bait I use now for spot fishing. Luckily for those of us who like an occasional easy catch, hooking a spot is one of those no-brainers. Little skill is required in the hooking and landing process of spot fishing, another kid-proof reason spot are perfect for family outings. Keep in mind that children are also great bait-catchers when loading up on small spot as bait for flounder, amberjack, or striped bass. Simply drop your bottom rig to the bottom, or cast it to a spot-holding location, and wait. If fishing from a boat, you may anchor or drift. There will be no doubt when a decent spot comes along and notices your offering, as evidenced by a swift tap, then a solid tug. Give the rod a quick lift to help set the hook, and then enjoy the fight. You will quickly discover why these uncomplicated, appetizing little dynamos are considered Virginia’s little star.